Use our 'Twas the Night Before Christmas' poem printable to make your own footprint Christmas cards. These handmade Christmas cards for kids are adorable and so easy to make using our free Christmas mouse poem! Simply print out our free printable Christmas card and add a footprint mouse. Why not make these handmade Christmas cards for all the family! Handmade Christmas cards for kids are always popular with family and these footprint Christmas cards are sure to be treasured! The footprint mouse is so adorable! 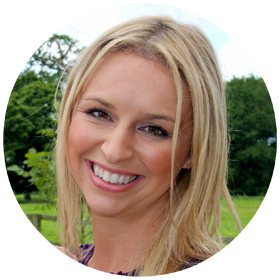 If you are looking for more Christmas crafts and activities to go with your 'Twas the Night Before Christmas' poem footprint mouse? You may like our Santa handprint or fingerprint Christmas tree. We love making keepsakes and have an ever growing collection! Click here to take look at all our DIY keepsake craft ideas. 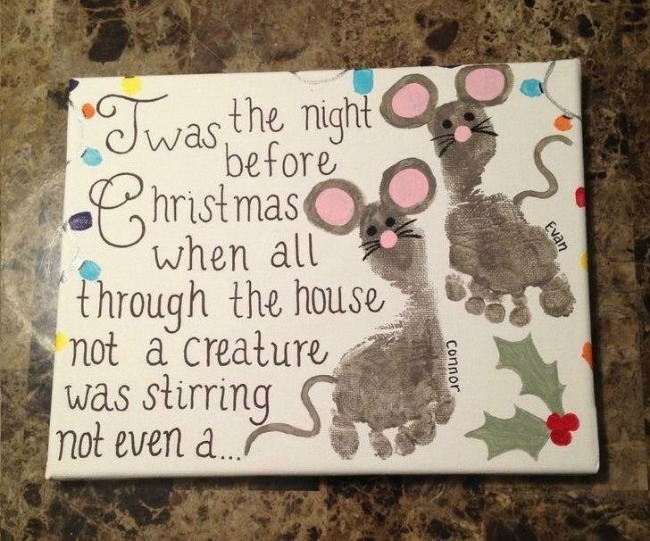 Last year I saw a gorgeous canvas on pinterest (pictured below) with the 'Twas the Night before Christmas' poem alongside 2 footprint mice and I fell in love with it. I can't find who made the canvas to give credit so please do let me know if you know the source. I also love this version by 'Crafty morning and this ceramic plate (pictured below) by painted zebra. 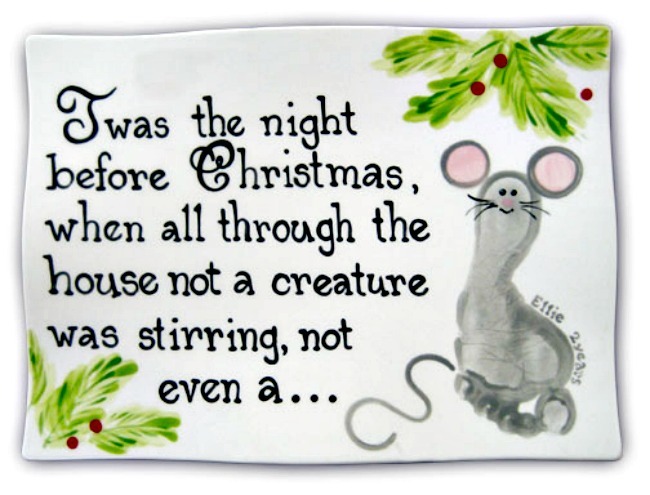 Feeling inspired I decided to make a 'Twas the Night Before Christmas' poem printable which included the poem with a space for a cute little mouse footprint. 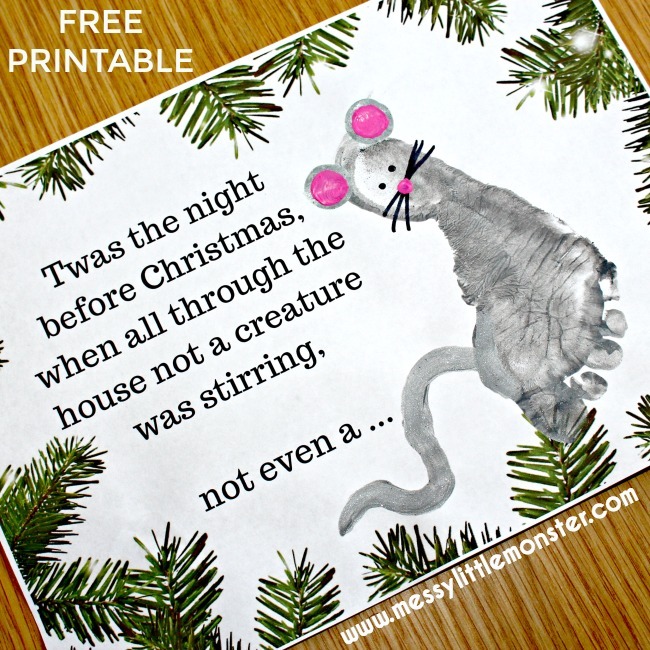 Simply download and print out the free printable Twas the night before Christmas poem. We printed it onto white card. Once the grey paint has dried add a pink nose and ears. 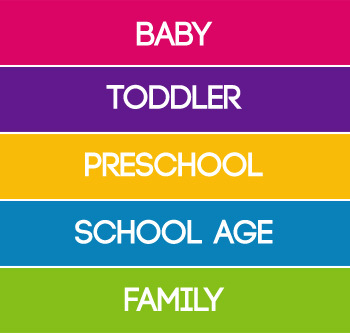 After you have made your Christmas mouse footprint adding a child's name and age would be a nice added touch. If you want your Twas the night before Christmas cards to be opened you will need to mount the printable onto a larger folded piece of card. I first made these footprints with Daisy (age 2) and she was so proud of her little footprint mice. I cant wait for her to hand them out to family at Christmas. To get this Christmas footprint craft printable for FREE type in $0 and click on the 'I want this' box below. It may take a moment for the page to load so please be patient. For personal use only. Not for redistribution. All images are copyrighted. Thank you. Take a look at our collection of Christmas ornament craft ideas for kids. Are you looking for more ideas for handmade Christmas cards for kids? This mouse craft is part of a kid made Christmas card series hosted by 'Mum in the Mad House'. Click on the link for more Christmas card ideas. We hope that you enjoy making these printable footprint Christmas cards. We also made a 'mistletoes' Christmas printable. 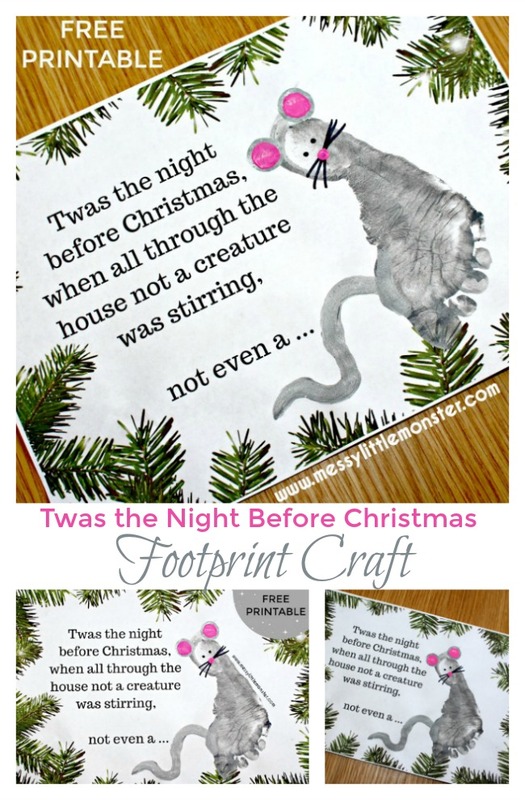 This Twas the Night before Christmas Poem and mouse footprint craft makes a great homemade Christmas card for kids. 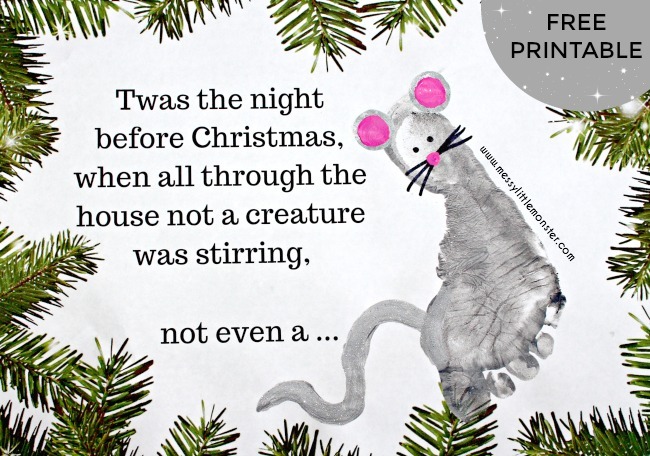 So what are you waiting for, download your Twas the Night Before Christmas Poem printable now and make your own footprint mouse Christmas cards. I love the fact it is a keepsake card. So cute and perfect for tiny little feet! What a lovely idea! I LOVE footprint ideas, they are extra special! So lovely to put in on a canvas for a keepsake. It is towards the end of the page. It might take a moment to load in so please be patient. Type in $0 to get the printable for free and then the 'I want this' button. I hope that helps.